The 850-year-old cathedral has survived frequent modifications, wars, revolutions and renovations. The full devastation of the mammoth fire at the Cathedral of Notre Dame of Paris on Monday remains to be tallied, but it's known to have destroyed the giant spire that housed some of Christendom's most sacred relics. French President Emmanuel Macron promised Monday night that "we will rebuild" the 850-year-old cathedral, one of the greatest monuments to Christianity in the world. Much remains unknown, including what caused the fire, but as firefighters and investigators sifted through the scene, answers to some questions emerged. What is the Cathedral of Notre Dame of Paris? The Paris cathedral — whose name means "Our Lady of Paris" — is one of seven cathedrals of Notre Dame in France and by far the most famous. Built on the Île de la Cité in the Seine beginning in the 1160s, it is an essential component of French identity and the home to irreplaceable works of art and religious significance, attracting more than 14 million visitors a year. The cathedral, which replaced an earlier basilica under the supervision of King Louis VII and Maurice de Sully, who became bishop of Paris in 1160, has survived frequent modifications, wars, revolutions and renovations — sometimes just barely. Much of the cathedral was damaged and many of its treasures were destroyed during the French Revolution, and in 1793, four years in to the revolution, it was rededicated to the Cult of Reason, with the Goddess of Liberty replacing the Virgin Mary on altars. Napoleon restored the cathedral to the Roman Catholic Church in 1801, and he was crowned emperor there in 1804. But upkeep of the structure was minimal, leading to Victor Hugo's depiction of the cathedral as a decrepit, barely functioning edifice in his 1831 novel, "The Hunchback of Notre Dame." King Louis Philippe didn't order its full restoration until 13 years later. Just last year, the Archdiocese of Paris launched what it called an urgent fundraising appeal to save the cathedral, which it said was again starting to crumble. No cause had been determined Monday night, but the Paris prosecutor's office said it had ruled out arson and terrorism. Speculation centered on the possibility that the fire may have been related to the years-long renovation project, which included the spire, but reports later emerged that no work was under way when the fire broke out at about 6:50 p.m. local time, after the end of the workday. Authorities said that no one was killed but that a firefighter was seriously injured. Among the priceless relics that was saved, according to the mayor of Paris, was the Holy Crown of Thorns, which the Roman Catholic Church says was placed on Jesus' head before his crucifixion. Historians have called it the cathedral's equivalent of the crown jewels. Mayor Anne Hidalgo said emergency responders also formed a human chain to salvage the Tunic of Saint Louis worn by King Louis IX during the Crusades, along with "several other major works." Michel Picaud, a senior adviser to Friends of Notre Dame, the organization overseeing reconstruction efforts at the cathedral, told NBC News that while the roof of the complex was destroyed, the flames didn't appear to have spread to the lower part of church, likely saving its revered 8,000-pipe Great Organ and its three famous stained-glass rose windows, which date to the 13th century. Twelve 10-foot-tall statues representing the apostles and four others representing Matthew, Mark, Luke and John are also safe. They were recently removed from atop the church as part of the ongoing renovations. 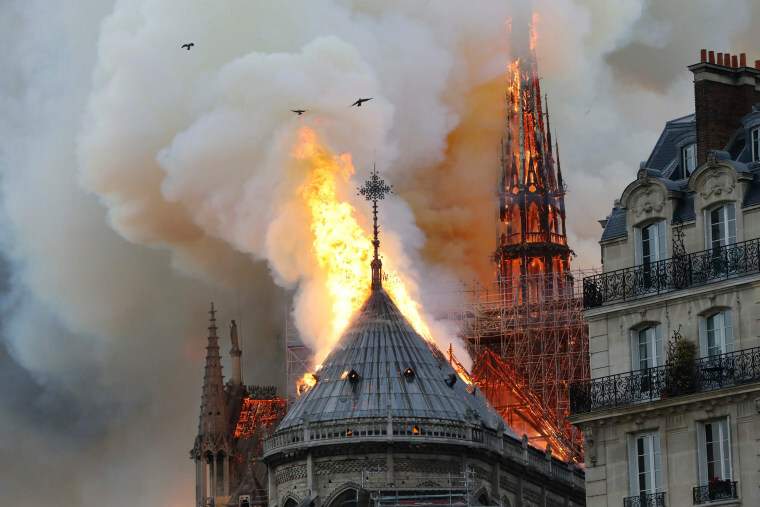 In addition to the roof and the spire, authorities said flames spread to one of the cathedral's two rectangular towers. But Jean-Claude Gallet, the fire chief of Paris, said: "We now consider that the main structure of Notre Dame has been saved and preserved." In a statement, the Vatican called Notre Dame of Paris "a symbol of Christianity in France and across the world," saying it was shocked and saddened by the fire. It thanked the estimated 500 firefighters who responded and called for prayers for "all those who are doing everything possible to face this dramatic situation." Cardinal Daniel DiNardo of Houston, president of the U.S. Conference of Catholic Bishops, said Catholics are "a people of hope and of the resurrection." "As devastating as this fire is, I know that the faith and love embodied by this magnificent cathedral will grow stronger in the hearts of all Christians," DiNardo said in a statement. UNESCO, the U.N. cultural agency, said the agency "stood at France's side to save and restore" the cathedral, which is part of its world heritage list. Speaking at an economic roundtable event in Burnsville, Minnesota, President Donald Trump said: "We all want to extend our regards and our hopes and our God-bless-you to Paris and to France." "It's a very very sad thing," he said. "I mean, you take a look at this, this is one of the true catastrophes." Trump suggested on Twitter that "flying water tankers could be used to put it out." France's civil defense agency responded that dropping water from the sky "could result in the collapse of the entire structure." Nancy Ing and Shirley Zilberstein contributed.